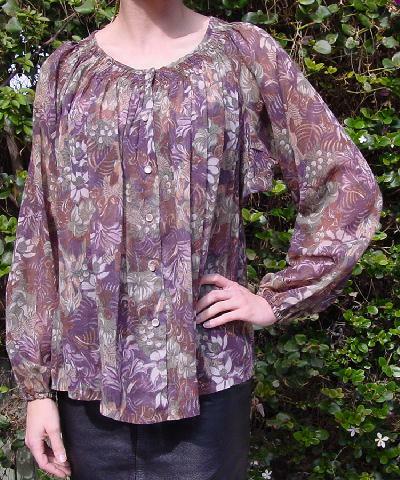 This vintage peasant blouse has six pearlized buttons down the front. 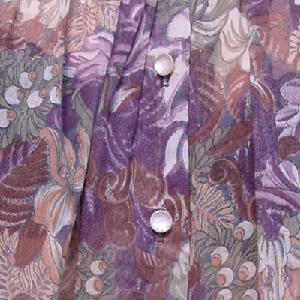 It has a wide rounded jewel neckline with 1" of three horizontal rows of stitched gathering extending downward from the neckline and long sleeves with elastic wrists. There is no fabric tag, but it's sheer and feels like a synthetic blend. It's in subdued olive green, chocolate brown, antique white, cappuccino, curry, and rose-beige. 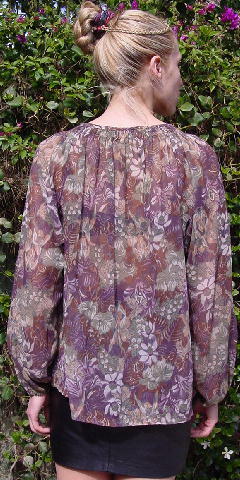 neckline to end of sleeve 27 1/2"
bottom hem side to side 28"